When it comes to running a facility, most managers spend the majority of their time putting out fires and handling personnel issues. So evaluating how time and money are spent ends up on the back burner. 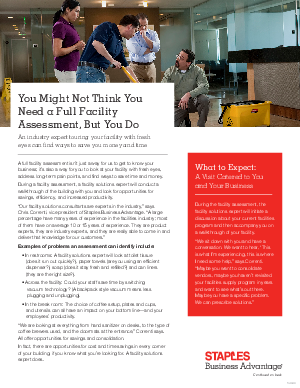 But with a comprehensive site assessment by veteran facility experts at Staples Business Advantage®, you’ll uncover problems and opportunities in every corner. Read our article and see how a site assessment can change everything.